March 10, 2015 (Washington D.C.)--President Barack Obama on Tuesday signed the Student Aid Bill of Rights, a presidential memorandum aimed at making it easier for graduates to pay off student loans. The Student Aid Bill of Rights, the latest in a series of reforms to help students, will require student loan servicers, or middlemen who collect on loan payments, to inform borrowers if they are late on payments so they can avoid default, and also inform borrowers if their loans are transferred to another company. The reform comes following complaints that some loan services intentionally misled borrowers or took steps that trigged late fees unnecessarily. In addition, The federal Education Department will set up a new website next year to make it easy for borrowers to file complaints about student loan servicers, lenders, collection agencies and schools so that the Department can respond quickly to resolve problems. The government will also establish a central site for borrowers to check on their student loan accounts and track payments themselves. If you make payments early, lenders will have to apply those prepayments to loans with the highest interest rate. The administration has taken other recent steps to help reduce student loan debt, including capping student loan payments to 10 percent of the borrower’s income for 20 years. The move has helped reduce student loan defaults and enrollment in the income-based programs has risen 64% from September 2013 to September 2014, according to the Department of Education. The Department of Education last week announced cancellation of contracts with five private collection agencies that reportedly deceived borrowers into believing they could have collection fees waived if they paid up past-due debts. The average college graduate has nearly $29,000 in student debt. 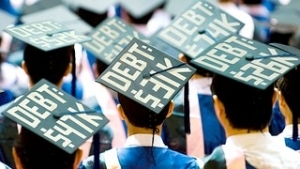 Nationwide, total student debt now surpasses $1.3 trillion, the Washington Post reports. The new rules will only apply to federal student loans, not education loans made by banks and other private lenders. However President Obama has instructed federal agencies to consider new regulations or laws to help protect consumers from predatory private student loan practices in the future.